The City Council is set to vote Tuesday on a contract with Family Health Centers of San Diego, the nonprofit selected to run the so-called housing navigation center, and on an agreement between the city and the Housing Commission necessary to move the controversial project forward. 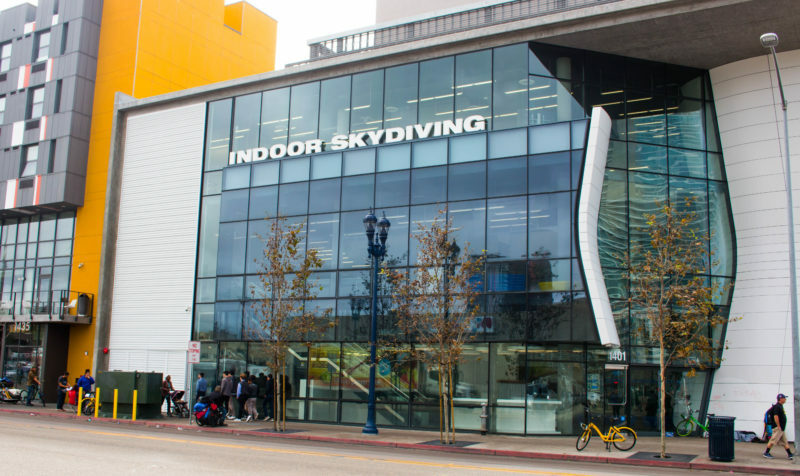 Mayor Kevin Faulconer is pushing forward a plan to convert a shuttered East Village skydiving center into a service hub for homeless San Diegans despite protests from nearby residents and their city councilman. Faulconer wants to turn the building at 14th Street and Imperial Avenue into a center where homeless San Diegans often overwhelmed by a confusing web of services can be guided to those that work best for them. The City Council unanimously approved the $7 million purchase of the former skydiving center in January and questions have swirled around the city’s plans and its purchase of the building ever since. The city selected Family Health Centers to operate the center and has promised it will provide an array of services, including workers focused on helping clients find housing, job training, veteran services and more. City officials this week also pledged that outreach workers will fan out throughout the city to aid homeless clients where they are and that those workers will provide transportation to help them get to and from the center when they must visit it to receive services. But it’s not clear Faulconer’s vision will become reality. Critics including City Councilman Chris Ward, who represents downtown, have said they doubt that the project, which aims to help homeless San Diegans more easily navigate to housing and other help, is the best use of city resources to address its homelessness crisis. After all, the center doesn’t provide any actual housing. Ward and fellow City Council Democrat Barbara Bry have also said they’d like to see a broader plan to address homelessness before they commit to sink nearly $1.9 million into the project this year – and likely an annual $1.5 million contract with Family Health Centers each of the next four years. City Councilwoman Georgette Gómez, a fellow Democrat, has also expressed interest in a homelessness strategy and her spokeswoman said Thursday the councilwoman has yet to decide how she’ll vote. The Housing Commission is working to finalize a contract with a Washington D.C.-based consultant to produce that holistic plan but it’s likely at least six months away. Faulconer’s team is determined to press ahead before then. To try to address concerns and persuade reluctant City Council members, city officials are set to detail their own work plan to incentivize more housing development, ramp up engagement with landlords who might rent to homeless San Diegans and explore other ways to try to find more housing opportunities for homeless San Diegans. They see the navigation center as part of that plan. Keely Halsey, now the city’s point person on homelessness, said the housing navigation center can help the city fulfill its goal to increase citywide coordination on homeless outreach and case management, and ensure that homeless San Diegans have access to workers focused on helping them find housing and connecting them with services that fit their needs. But Ward and others are skeptical. After all, Ward and Bry have said: The navigation center’s success rests on having housing to navigate homeless San Diegans to. He said the city’s bridge shelters, safe parking lots and other homelessness investments have driven home that the city’s biggest challenge in its efforts to aid homeless San Diegans is the lack of housing. Ward, who chairs the city’s homelessness committee, said he has urged the mayor to instead invest in a number of other solutions including a subsidy pool to aid homeless clients struggling to find affordable homes with Section 8 vouchers or to expand a program meant to reconnect homeless San Diegans with family members. The mayor’s team said Thursday it has made tweaks to its plans in hopes of addressing some concerns that have been raised. For example, city officials plan to ramp up security and city clean-ups in the area to stave off increased blight, as they have when the city opened a new storage center in Sherman Heights. Kathleen Hallahan of the East Village Residents Group, which has raised concerns about how the project could affect the neighborhood, said she had not heard from city officials about those adjustments as of Thursday afternoon. “I just cannot see where they have even addressed any questions or inquiries and concerns of the neighborhood or the downtown community,” Hallahan said.